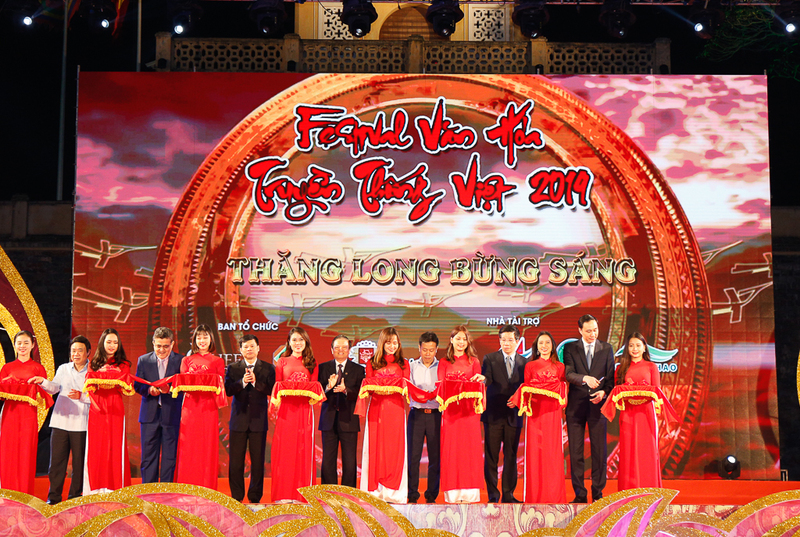 NDO – The Vietnamese Traditional Culture Festival and International Cultural Exchange, themed ‘Bright Thang Long’, officially opened on April 5 at the Thang Long Imperial Citadel in Hanoi. The event aims to contribute to preserving and promoting the values of advanced Vietnamese culture imbued with national identities, in line with the Party’s guidelines and State’s policies. At the opening ceremony, visitors were delighted by performances of folk art forms that have been recognised by UNESCO as the world’s cultural heritages, including Quan Ho (love duet singing), Xam (blind busker's singing), Chau Van (ceremonial singing), Vi – Dam folk singing, the Cultural Space of Gong of Central Highlands, Cai Luong (reformed theatre) and Don Ca Tai Tu (a traditional musical art form of the south). During the five-day festival, a wide variety of cultural exchange activities and unique performances will also be held, such as the reproduction of the space of Vietnamese villages and traditional rituals, particularly the Mother Goddess Worship religion, a lantern road with hundreds of lanterns shaped as lotus and non la (conical hats), a show of traditional costumes, folk games and a display of flowers. The festival features numerous pavilions of tourism products, aiming to promote the image of the land and people of Vietnam to international friends, while affirming the development of the Vietnamese economy. In addition, seminars on traditional culture and a ceremony to honour outstanding businesswomen will be held on the occasion. The festival is expected to attract nearly 300 enterprises from 63 provinces and cities, as well as around 10,000 visitors.